All smiles with YFT on the horizon! Crewman Ben gives the thumbs up for departure! Ben, still feeling very optimistic! Capt Kenny with Carlos Parada and a nice YFT halfway through a very busy day! Close your eyes and make a wish, Capt Aaron Remy. Bill C. and his jackpot winner! 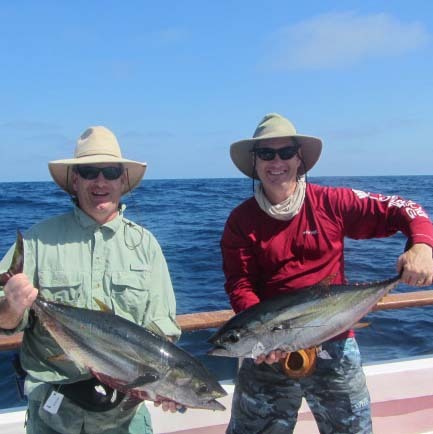 Capt Aaron Remy gaffs a nice tuna for Dave. They got into an awesome tuna bite! Kenny is happy to gaff this nice YFT for Carlos! Great weather and lots of room at the rail! Snacktime- Can you say "toro"?! Yum!